Main Line Supply, Inc., was established in 1955 as a hard goods supplier. Main Line Supply is a privately-held industrial wholesale company specializing in the distribution of pipe, valves, and fittings to a variety of industries. 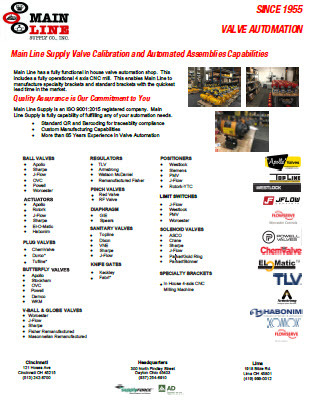 Main Line Supply has remained a leader in the industry for more than 60 years. Main Line Supply's business is 100 percent focused on distributing to the industrial market. Located in Dayton, Cincinnati, and Lima, Ohio, the company sells to more than 1,000 industrial and commercial accounts throughout the United States, although its primary territory covers Ohio, northern Kentucky, and eastern Indiana. Main Line depends upon their extensive technology to keep their operations running smoothly and effectively. Main Line invests in computers and communication systems that best allow the company to meet and exceed customer expectations. Current technology support includes secured on-line real-time tracking from remote locations, and instantaneous tracking of orders, dates, contacts, and electronic payments. Main Line Supply serves the primary markets associated with Pulp & Paper, Utilities, Institutional, Commercial, Manufacturing, Government and Municipalities. We work with Mechanical Contractors - Piping, heating, process and power instrumentation, Refrigeration and commercial, industrial plumbing. Supply FORCE has lasting relationships with key leading PVF manufacturers, allowing us to provide national pricing programs, cost savings initiatives and more. Bringing growth-oriented independent distributors and best-in-class suppliers together to outperform the market.